Morgane Schmidt Gabriel tests out a deceptively simple core training tool. If you’ve read any of my previous reviews you’re probably well aware of the fact that I approach most things with a healthy dose of skepticism (or at least mildly amused sarcasm). It’s probably no surprise then that when I was first introduced to the Equicube I was fairly certain it was just a gimmick. I mean, honestly, how helpful can a five pound block of rubber actually be in developing your seat? The answer is apparently, ‘really helpful’. Who knew? Victoria and Blue warming up with the Equicube. Photo by Morgane Gabriel. According to the website, the idea behind the Equicube is that when it is held properly with the reins– meaning with the top is kept flat and level a few inches above your horse’s withers– the Equicube encourages the rider to engage her core and allows her to feel her seat, shoulders, and legs rather than trying to focus merely on holding the correct position. Basically the Equicube makes you focus on riding with your seat and core rather than your hands (because, you know, your hands are busy holding a big rubber brick). While I’m no scientist, observation has shown that in everyday life most people tend to favor using their hands to balance and adjust. If we feel like we’re falling we reach out to catch ourselves; I’ve never seen anyone whose natural reaction was to engage their core and drop down through their seat bones to stabilize (although perhaps I’m just hanging with an awkward crowd). This innate tendency to grab ahold and move things with our hands can get in the way when we’re riding. That’s where the Equicube comes in. 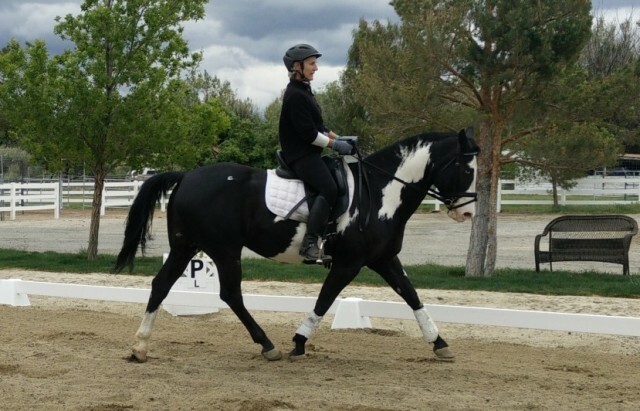 I initially tested the Equicube myself while riding a third level Friesian gelding. While I ride numerous horses and am pretty aware of engaging my core and riding from my seat, I must admit that sometimes it’s easy to fall into a less than engaged sort of ride, particularly if you’re less than mentally focused and the horse is well schooled enough that you can get away with it. I found that riding with the Equicube for five or ten minutes provided a nice reminder for me to engage my core and ride more from my seat. When using the Equicube, if you try to support the weight of the cube with your arms or if you tip forward off your seat bones, the weight of the cube quickly becomes apparent and awkward. However if you sit down on your seat bones and engage your core to counter balance the cube it’s actually quite light and manageable. This is one of the main ways the Equicube encourages you to use your seat and core- you’re forced to engage your abs because you need them to counter balance the weight of the cube and keep it steady. The width of the cube also encourages holding your hands at the proper distance from one another which also aids in activating your core. This is because it forces you to use your seat to ride the horse from behind and into the contact to make him round rather than spreading your hands wider and pulling his head down and into a ‘frame.’ In addition to that, the fact that your hands are connected in essentially a fixed position also means they must be quieter and this further forces the rider to figure out of to use their body (rather than their hands) to move the horse’s body. For my test rides, the horse I was riding didn’t seem to mind the cube or my awkward initial rein adjustments but I think it’s important to note that the Equicube is a tool for teaching the rider, not training the horse. Although the horses did not mind the cube, and some even went quite round and nicely into the contact, the rider’s inability to use the reins independent of one another to supple one side or the other make it difficult to school the horse if he’s not wanting to be particularity on the aids. After I played around a bit with the cube I decided to foist its awesomeness upon some of my students. I worked with students ranging from a ten-year-old intermediate beginner rider up through advanced level AA riders. Every rider showed improvement from using the Equicube. This is not to say they were always thrilled with the process. Initially some found the cube unwieldy and a bit awkward (generally because they were trying to hold it with their arm strength rather than engaging their core to counter balance it). One student was afraid that she’d be unable to turn her horse while using it (her horse turned just fine and she used her seat to do it). A few of the more advanced riders were a bit distracted by their inability to use independent right and left rein aids (though once they focused on using it as a tool to work on themselves rather than train their horses they were fine). In spite of these initial grievances, every rider’s position and use of their seat improved after using the Equicube AND they all said they could feel an obvious difference with how they were using themselves afterwards. The Equicube has since been dubbed the ‘Majikal Cube’ around the barn and multiple clients actually ask to use it a bit at the beginning of their lessons (I work with a particularly humorous, slightly masochistic bunch). Ultimately, given my experiences using it, I think the Equicube is an effective tool to help riders figure out how to use their bodies more efficiently and effectively. While some riders just have an innate sense of how to do that, I think there are quite a few more who could benefit from a tool that ‘shows’ them how. Because the Equicube makes you engage your core, it takes some of the guesswork out of how to do it. If you’re interested in learning more and seeing the Equicube in action, check out the Equicube website! The Equicube is available for sale through the site for $79.00. It’s made in the USA from 100% recycled materials which means it’s also environmentally and economically responsible. Go Riding with The Majikal Cube! Morgane Schmidt Gabriel is a 31-year-old teacher/artist/dressage trainer/show announcer/ who still hasn’t quite decided what she wants to be when she grows up. A native Floridian, she now lives in Reno, NV, where she’s been able to confirm her suspicion that snow is utterly worthless. Though she has run the gamut of equestrian disciplines, her favorite is dressage. She was recently able to complete her USDF bronze and silver medals and is currently working on her gold. Generally speaking her life is largely ruled by Woody, a 14.2 hand beastly quarter horse, Willie, a gawky 4-year-old Dutch gelding, and Stormy, her friend’s nearly all white paint gelding with a penchant for finding every mud hole and pee spot in existence. Visit her website at www.theideaoforder.com.